Grant has worked extensively in theatre, film, TV and radio. He has also worked in MOCAP at the Imaginarium for the computer game Squadron 42, has voiced several computer game characters including Bloodborne and Dark Souls. He can be booked via voices.com here. He wrote and recorded an audio guide to Soho, a clip of which can be heard here. You can watch his showreel below and see his full Spotlight CV here. For IMDb click here and clips from the mokumentary Cast Offs see below. ‘I liked Grant Gillespie’s Oswald, not an easy part to play, paradoxically, because the character can easily seem simply naff and smarmy. Gillespie plays him as smug and sly, an objectionable little man who thinks he knows how to make the best of other people’s disasters.’ John Peter, The Sunday Times. ‘Grant Gillespie’s self-seeking Oswald personifies the moral vacuum at the heart of the new regime.’ Fiona Mountford, Evening Standard. ‘There is some excellent work from Grant Gillespie as an unusually vivid Oswald.’ John Gross, The Sunday Telegraph. ‘In the small but significant role of Oswald, Grant Gillespie shows how a weak man becomes a monster.’ Lyn Gardner, The Guardian. ‘Oswald (Grant Gillespie) provides the only flicker of light relief in this dark and bleak drama.’ Robert Tanitch, Morning Star. ‘Grant Gillespie plays the intelligent courtier and confidential go-between with affectation and camp delight, his dying act of humanity changing the course of the play.’ Kevin Quarmby, Rogues and Vagabonds. ‘Grant Gillespie’s marvellously fey and effete Oswald is another little gem, rolling on and off the stage on what appears to be frictionless castors and bowing foppishly to just about anyone in his sights.’ Teletext. ‘Role playing pays off handsomely, not least with Grant Gillespie switching from Sly’s high-heeled wife to a Birkenhead Biondello.’ Michael Billington, The Guardian. ‘The real scene stealer is Grant Gillespie’s deliciously camp Liverpudlian Biondello.’ Terry Grimley. Birmingham Post. ‘In the role of Biondello Grant Gillespie’s natural charm and Scouse accent worked perfectly.’ Alan Kersey, Cambridge Evening News. ‘The supporting cast weigh in with some excellent performances, particularly Grant Gillespie’s lovelorn peasant Peter.’ Jane Tadman. Sheffield Telegraph. ‘A splendidly scene-stealing turn from Grant Gillespie as the bewildered beau.’ John Highfield, The Star. ‘Lucy Briers and Grant Gillespie inject some delightful broad comedy.’ Lynda Murdin, Yorkshire Post. ‘There is some truly outstanding supporting cast in Lucy Briers and Grant Gillespie a delightful comic double act as rustic young lovers.’ John Highfield, The Stage. ‘Grant Gillespie musters real conviction.’ Nicholas De Jongh, Evening Standard. ‘Grant Gillespie is impressive as a choric beggar who, clad in striped blazer and white flannels, looks as if he opens the batting for the Corinthian Casuals.’ Michael Billington, Guardian. ‘Grant Gillespie’s dissolute Sebastian Flyte of a choric beggar captures a wily sardonic detachment.’ Ian Johns, The Times. ‘Sardonic and cool, Grant Gillespie as the Beggar, dispenses witty and accurate colloquialisms.’ Glen Baker, Morning Star. ‘Grant Gillespie likeably amalgamates the comic and earnest phases of Kit Nubbles.’ Benedict Nightingale, The Times. ‘The verbal confusion continues with additional tales from fellow gossipmongers, including the flamboyantly outrageous Sir Benjamin Backbite, perfectly portrayed by Grant Gillespie.’ Rob Holcroft, Worcester Standard. 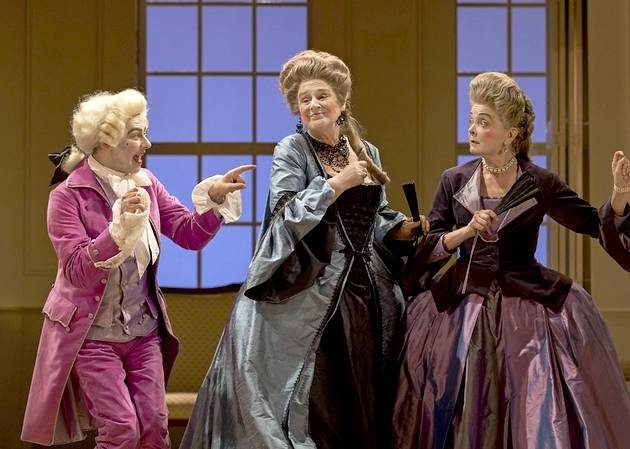 ‘An excellent ensemble provides an indefatigable source of delight, Grant Gillespie, dressed like Mozart’s wayward little brother, out-camps everyone as preening ninny, Sir Benjamin Backbite.’ William Stafford. ‘Ms Steed is perfectly matched by Grant Gillespie’s gossipy, painted, over-ripe and equally destructive Sir Benjamin Backbite .’ Richard Edmond, Birmingham Post. 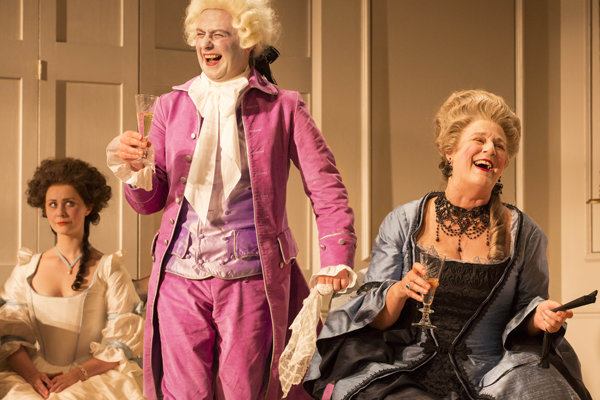 ‘Deliciously over-the-top performances from a foppish Crabtree (David Killick) and equally mincing Sir Benjamin Backbite (Grant Gillespie) – all pink and pique – set the tone for a light-hearted romp.’ The Advertiser.